Enter Our Ocean Book Giveaway! Enter your details below to be in with the chance of winning a copy of our upcoming Ocean Book by Clare Beaton! The undersea world is a sensational source of fascination for children. Clare Beaton shares her passion for the world around us with inventive ocean crafts perfect for school or at home. Includes inspiring fact pages, healthy recipes for the whole family and fresh-air activities to encourage well-being. By entering this competition you are signing up to the b small newsletter. (If you are already subscribed to our newsletter you are also welcome to enter.) If you do not wish to be contacted this way, please email books@bsmall.co.uk with 'Competition unsubscribe' in the subject box of the email. Your details are never shared with any third party. 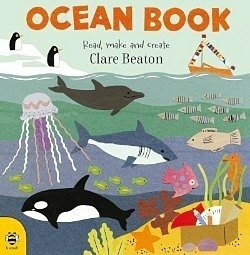 Thank you for your entry to win Clare Beaton's Ocean Book- best of luck! Winner will be announced on 01/05/2019.